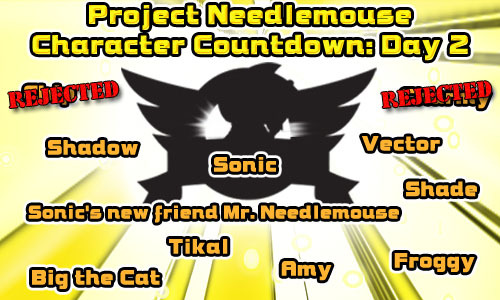 The second day of the Needlemouse character countdown has begun with todays call of action being directed towards the SEGA and Sonic Facebook pages, where more tasks await. Yesterdays efforts succeeded in ridding the title of Chip (who’s “dead” anyway) and Charmy Bee. You’ve got to leave eleventy billion comments there today – or 500. I forget. Go see on the Blognik for more details. If two characters are going to be knocked out each of the four days, then why i’m getting the feeling that Sonic, Amy and Shadow will be the remaining ones left. Although i do hope Shade gets in, of even maybe Mr.Needlemouse perhaps, whoever it is. Hey AAUK. Can you update the SEGADriven affiliate button when you get the chance? My sonicyoda.org URL expired a while ago. Can you link it to segadriven.com please? Cheers man.